The title was encouraging – a Listener crossword that is ‘Child’s Play’. Ha ha! Then there was the promise of a bit of drawing at the end – if we got there. Lovely! We started with the thematic clues and NAGA and COMPANION leapt into view, but I didn’t know what a naga was and didn’t spot the obvious. Typical of the 8X8 team! We plodded through the clues with our satisfaction only mitigated by our tendency to opt for the corrected letter rather than the misprint, which led to a few strange instructions. However, the word LETTERS soon appeared and then ‘DELETE ALL BUT SEVENTY-FIVE’ – that was almost half the grid but didn’t correspond to the totted-up total of thematic clue lengths. We have almost a year of experience now and know that all will be clear in the end (sometimes!) so we struggled with the last clues. 13ac. Informer fails to complete hotel check (4) We were hunting for CHICK or CHUCK for our corrected word and played with NESH for ‘cowardly’ or ‘chicken’ but the informer was likely to be NOSE (failing to complete – so NOS) with H for hotel. We couldn’t see the link with CHUCK until our wise friend told us that was a word for food. Of course, that letter made no difference to the final grid. I am beginning to understand why friends prefer crosswords where the corrected letters are the ones that count. Clearly, in a case like this, one can solve the puzzle without necessarily knowing what the correction should be – which doesn’t seem quite right. I suppose the plural of an ancient Greek word is ‘child’s play’ to most of the regular Listener solvers but NAOI held us up too. Having once played an infant Mustardseed in MSND, I had no problem with the Pyramus quotation and Bottom’s THISNE but we didn’t know where to look for it in Chambers. Is it there? With all the clues solved and a sprinkling of white cells here and there, the grid began to look suspiciously like a familiar board game. The p.d.m! Wasp, losing W(ife) gave us ASP and all was clear. Once we knew that we were hunting for snakes and ladders, the thematic clues soon resolved themselves into a convincing knot of snakes and a slightly less convincing pile of ladders. STY was up there near the finish of the game and was clearly the required ladder but that clue ‘Indeed in the past this would be frothy’ was almost too subtle for us – Indeed in the past (YEA) with this (STY) was frothy – so YEASTY. Hmm – clever! The wretched ANACONDA was a threat too. If he stretched to his full length, he seemed to finish in the cell where the ASP started. That would be a vicious trick to play on any trusting little kiddy – to send him down a couple of snakes, one after the other. However, if those two brutes shared a cell, we were one letter short, so, clearly our little board-game playing friend was going to be allowed to climb back up the anaconda’s tail. Had anyone told me, a year ago, that to complete these things, you need an encyclopaedia article on snake types, a set of coloured pencils and a modern Greek grammar, I would have assumed he was a crackpot. Ah well, the sting is in the tale. This was great fun. Thank you, Dysart. This entry was posted on 27 November 2009 at 5:05 pm	and is filed under Solving Blogs. 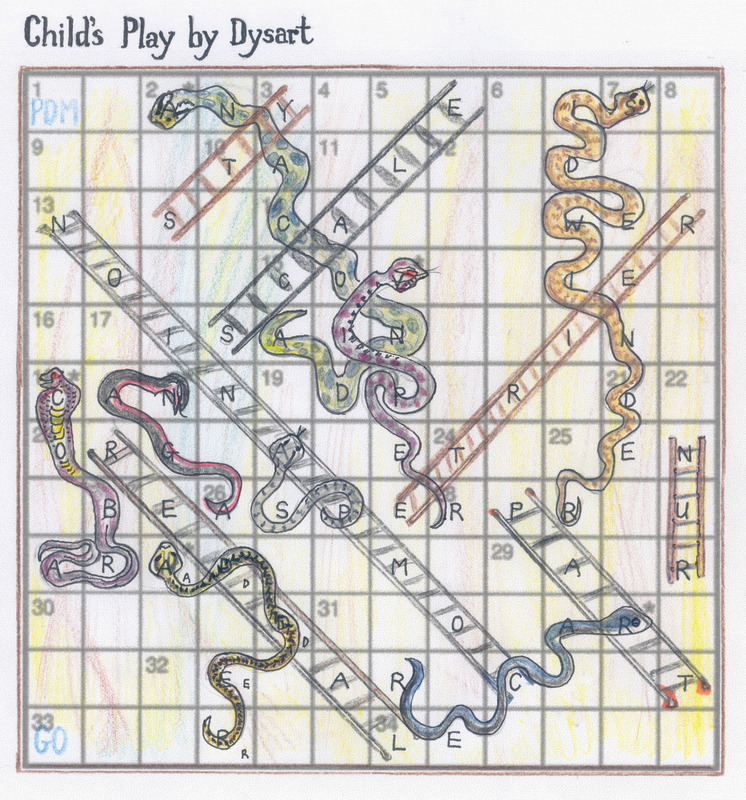 Tagged: Child's Play, Dysart, Snakes and Ladders. You can follow any responses to this entry through the RSS 2.0 feed. You can leave a response, or trackback from your own site. Stiff competition from Erwin this week on the drawing front, Shirley. Well done though, so award yourself a silver star. As for THISNE, I think the only place you’ll find it is in the play itself. I too was lucky … we did MSND for O-level (not that I can remember much from that long ago). Thank you for your kind comment below Shirley. I agree that snake’s head at the top makes sense, as if you are being swallowed, and it is by far the more common but they look easier to slide down when starting from the tail. Your drawing is superb as ever and I especially admire the realism. My only attempt at the natural look was the hooded cobra except that the hood is drawn inside out! I tried to make the racer look sleek and fast but ended up with something resembling an embarrassed sperm. Shirley, I think such awesome snakes fully entitle you to the occasional off-course slither. That is one impressive drawing – I said I was looking forward to seeing some well-rendered snakes and that’s what I got. Upping the ante on the visual part of the crossword makes me want to dumb mine down even more, though now I’m solving in a blue pen that will look really garish once scanned.